A fair financial solution that covers the cost of your education. We believe in equal opportunities for all, irrespective of your financial background. Ambitious individuals can focus on their studies, making the most of their education. Once they have graduated and earn above the minimum income threshold they make income-based repayments. Every member of our community believes in equal access to education and actively works towards making this a reality. CHANCEN International has partnered with Akilah Institute to offer students Income Share Agreements (ISA) to finance their diploma courses. With an ISA, students can focus on their studies at Akilah, while CHANCEN takes care of the tuition fee payments. Once graduates start working and earn above the minimum income threshold, they make income-based repayments. CHANCEN is a community of members who are united in solidarity to increase access to tertiary education for current and future generations. Together with Akilah we ensure students are empowered through socially responsible financing and free to focus on their studies. The Akilah is a higher learning institute based in Kigali, Rwanda. Their unique model prepares students to launch successful careers in the fastest growing sectors of the economy. All students receive intensive leadership training, career development services, and community service opportunities. 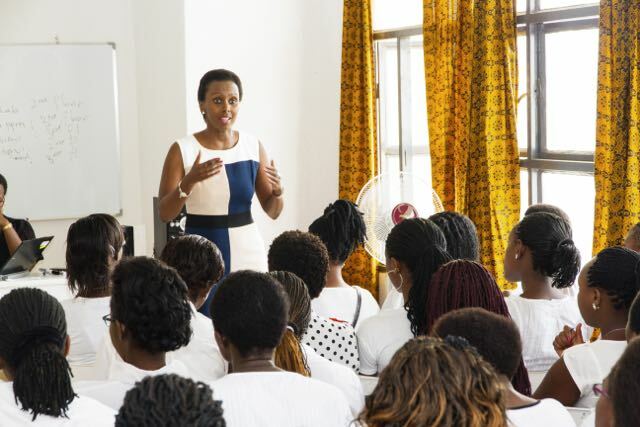 They envision a network of campuses in East Africa where future generations of women leaders and professionals receive high-quality education. Income Share Agreements (ISAs) allow you to focus on your studies, while CHANCEN takes care of your tuition fees. Our community supports you to excel in your studies and succeed in your career. We pay your tuition fees whilst you study. Once you have graduated and you start earning a monthly income above 80 000 RWF you start your repayments. Graduates do not have a fixed amount of debt. Your repayments are set percentage of your monthly income, 9% of your net salary. You commit to repaying for 8 years. You can shape your career without additional financial pressure. Graduates, Impact Investors and Universities are united in their commitment to giving all students access to education. Your repayments ensure the next generation can study too. Students who wish to study Information Systems, Business Management & Entrepreneurship and Hospitality Management apply directly to Akilah Institute here. Once you have been offered a place to study at Akilah you will receive a link to our online ISA application via sms. The application link will direct you to a portal where you need to complete 3 steps. Write a short motivation as to why you would like to join our Income Share Agreement community. You will be invited to attend a workshop with our CHANCEN team where we will introduce you to our community. Now you need to pay your 30% commitment fee to Akilah. Complete the online questionnaire from us and we will then contact you to sign your Income Share Agreement. You are now part of the CHANCEN community and you are a student at Akilah. We pay your tuition fees directly to Akilah so that you can focus on your studies. Income Share Agreements depend on the commitment by all members of the community, united in their striving for equal opportunities. Some graduates will repay smaller amounts in relation to the contribution from CHANCEN. Because the repayment is income dependent, other graduates may make larger repayments. These differences in repayment amounts are balanced out by the solidarity nature of the community. The risk of an ISA is never carried by one person, rather by the community as a whole. Fair financing offers a great advantage in comparison to regular credit institutions. With a regular loan, borrowers have fixed debt. The high-interest rates and the repayment plans are not income based. In this case, borrowers also have the risk that their repayments will not be relative to their income. A loan is restrictive, it does not take into consideration extended study periods, parental leave or start-up phases for entrepreneurs. Income Share Agreements always adapt to your current income and assesses individual circumstances. We give you the freedom to shape your career. Our fair financial model is based on three values. This is the foundation of all the work we do, each aspect is taken into consideration in the Income Share Agreement cycle. Funders and Investors who align with our values enable us to invest in an individual student’s tertiary education. Our partnerships with universities ensure that these institutions are fair and that access is not based on an individual’s financial background. Our fair financial model does not only allow students freedom during and after their studies but we also aim to empower them, with financial literacy training, soft skill development and support into the labour market; we are building a solidarity community around our student of which they will also be a part of even beyond their graduation. These values unite graduates, donors, Impact Investors, Universities, partners and NGO members in a solidarity community that to offers students an opportunity to be part of an ethical financial solution. CHANCEN International offers Foundations, Corporates and Impact investors a wide variety of options for your sustainable contribution to a long-term, ethical financial solution for tertiary education in Africa. Options include CSR partnerships, donor investments with returns funding the next generation of students and impact investments options. Once you have decided how you want to increase your impact with us we develop our partnership plan with you. We always think long term, this is how we can ensure that we make an impact over many generations. By partnering with us you become part of our CHANCEN community, like every student and graduate we all strive towards ensuring every individual has access to tertiary education. 1. Delivering value to society by offering holistic tertiary education with a focus on leadership skills, changemaker initiatives and community development. 2. An institution that offers a supportive environment that cultivates initiative, drive and grit. 3. The availability of efficient systems that allow for full transparency showing how values and actions of the institution are aligned. 4. Proof of a high level of employment amongst graduates, with higher employee satisfaction. Transparency and efficiency is key to our model. With access to over 20 years experience, we ensure that our students are offered the fairest repayment terms, our partners can trace their impact and we can scale according to need. Our unique software allows us to interact with all parties in a unique manner but still ensures that we can efficiently scale. Our operative costs are never more than 10% of a student's total tuition fees. All our partners become part of our sustainable, ethical financial model. Regardless of your partnership with you will always be investing in more than one student, because we can ensure that through the repayments of current students the next generations tuition fees are covered too.